Light, thin, delicious crêpes ready to be used however you desire. Let the batter rest – just like pancake batter. That’s not true. They’re very easy to make and are amazingly versatile, too. If you can make pancakes you can make crêpes. They’re cousins, if not siblings, of the kitchen. The word is French from the latin crispa, meaning “curled.” When most people think of crêpes they think of French cuisine. Crêpes can be made for both savoury and sweet fillings. The difference is the addition of sugar in the batter for sweet dessert crêpes. That’s it. 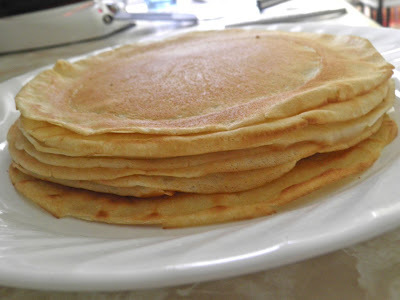 There are some very famous recipes that have crêpes as the star. Crêpe Suzette, probably the most famous dessert crêpe, is simply folded crêpes with orange peel, and Grand Marnier liqueur that is dramatically lit afire at the table. Mille crêpe is a “cake” made from many individual crêpe layers. Between each one is a sweet filling—usually pastry cream—but many others are used as well. I saw a Nutella mille crêpe recipe not too long ago. Savoury crêpes can be served for lunch or even dinner. Fillings include cheese, meats, mushrooms or a combination, and even ratatouille (a recipe for which I posted two days ago). My pan made 8" crêpes. Although “crêpes” are mostly associtaed with French cuisine, their popularity is worldwide, albeit with different names. In Sweden they are pannkaka, and in Denmark, pandekage. In Italy, crêpes are called crespella – which is very close to the Latin origin. In Spain they are a staple at carnivals. Crêpes are also part of the cuisine of Austria, the Netherlands, Germany, Turkey, Chile, Argentina, Russia, and many more countries. One way I like serving crêpes is in blintzes. 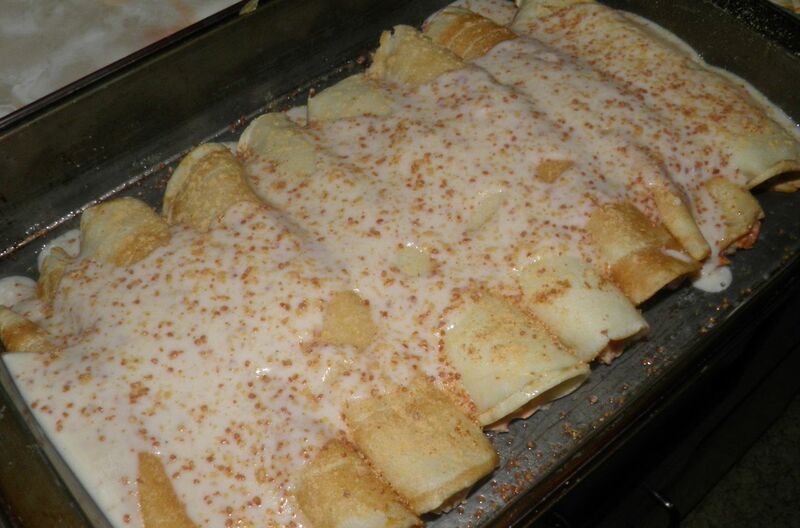 A crêpe is wrapped around a filling of cottage and cream cheese whipped with cinnamon and nutmeg. The stuffed crêpe is then fried lightly and served with a fruit sauce of apples, blueberries, etc. A non-stick pan, although a great help, is not necessary for making crêpes; neither is a crêpe pan. Even if you use a regular frying pan there is probably enough butter in the batter to ensure they don’t stick. You can help by rubbing the pan with a little butter between frying each crêpe. 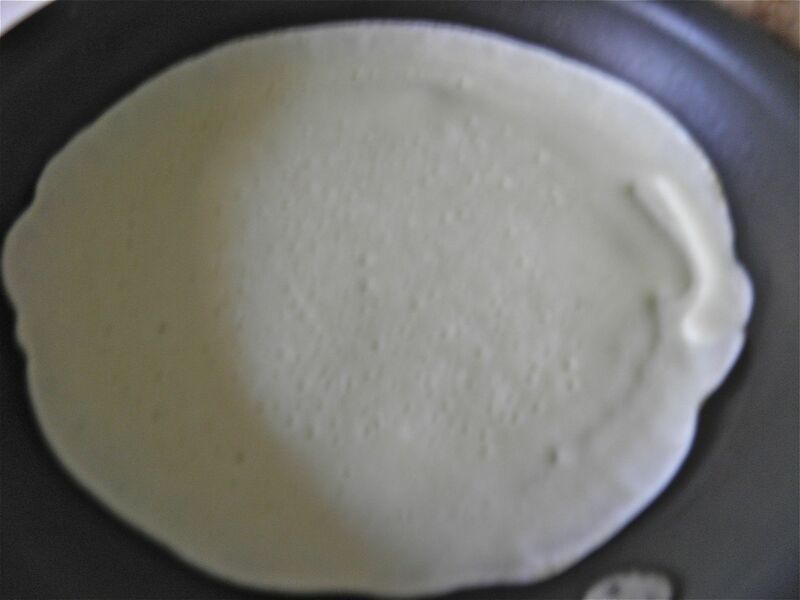 The big secret to thin crêpes is to quickly swirl the batter around in the pan as soon as it is added. It's very easy to do, but you have to act fast. If you’ve never made crêpes do yourself a favour and try. They're really easy and quite impressive. Small bubbles will form on the top surface as the bottom cooks. Place the flour and eggs in a bowl. Mix until well combined. Slowly start to add the milk, making sure the you do so slowly so lumps don’t form. Once smooth, add in the butter and salt. If making crepes for a desert add the sugar. Mix well. 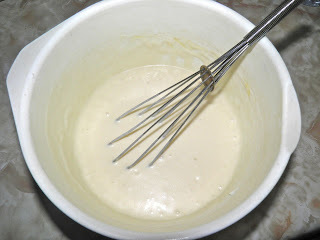 Let the batter sit for 30 minutes for the gluten in the flour to relax. Heat a non-stick pan or crepe pan on the stove. Using a measuring cup, ladle 1/4 cup of batter into the pan. Instantly pick up the pan and swirl the batter to cover the bottom. 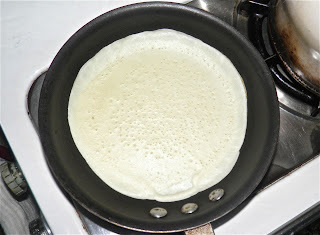 Let cook until small bubbles form on the top surface and the crepe starts to slightly brown on the edges. Flip the crepe and let brown on the other side. Cooking both sides shouldn’t take more than 1-2 minutes. Remove each crepe to a plate as they cook. Then use as directed in your recipe. Salmon stuffed crêpes with mornay sauce, ready for the oven.